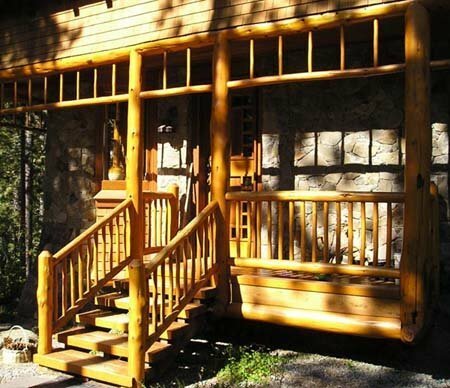 Geronimo Pole Co. offers over a dozen custom railing designs. The simpler and less expensive rail systems are fabricated with straight pickets and hard rails. 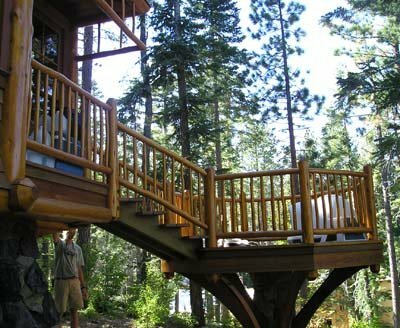 Some of the more custom railing systems may include copper spindles, curved branch pickets or even gnarled handrails containing character burls or “catfaces”. Various wood species can be used to fabricate a railing design. Douglas Fir, Lodgepole Pine, and Incense Cedar are more commonly used while more exotic options include character Manzanita, Madrone or even Oak. Our customers can pick and choose any railing system appropriate to their architectural needs or create a design to their own liking. All material is handcrafted and hand peeled according to the style of the rail design. Posts can be pre-drilled for rail sections and rail and picket ends are typically tenoned. While typical rail lengths are eight feet we have fabricated six-inch diameter rails that stretched to 18 feet in length. Prices vary according to species of wood, diameter, size and style design. Call to speak with a representative for a more specific and personal request. For a custom railing system quote, fax or mail us a drawing following the guidlines and examples of our railing ordering guidlines and railing examples documents.